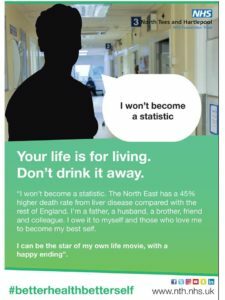 North Tees and Hartlepool NHS Foundation Trust this week launched a campaign to raise awareness around the risks of excessive alcohol consumption, encouraging its communities to reduce their drinking and reduce their risks. The la test initiative, fronted by Medical Director Deepak Dwarakanath, reminds people to take control and be a ‘star in their own life story’. By getting the measure right, you can improve your relationship with alcohol, and improve your own health. 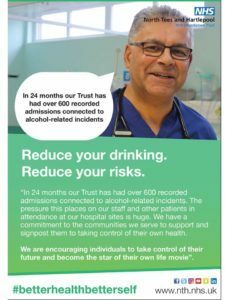 The campaign will include the stories of staff members from across the Trust, speaking out about how alcohol abuse impacts on their day to day role, often placing them in significant danger. It also highlights the associated health risks including high blood pressure and heart disease, as well as seven types of cancer. These are all really important directives, which will of course be accompanied by some self-care guidance for those who are affected by the messages. Since January 2017, the Trust has seen over 600 alcohol related admissions through its doors. Many of these patients have liver disease and die during this admission, at an average age of 54 years old. In the North East, there is a 45% higher death rate from liver disease than anywhere else in the country. People are being urged not to become a statistic, and make a change today. The Trust is launching a ‘One Week Alcohol Free’ initiative on the 25 February and is encouraging as many people as possible to get involved. Taking a week out allows a person to reflect on their relationship with alcohol, and create healthier habits. The UK Chief Medical Officer’s Low Risk Drinking Guidelines recommend adults to drink no more than 14 units per week (one unit = half a pint of lager), and these should be spread over at least three days. Currently, 1 in 4 adults knowingly exceed this advice. The more alcohol people drink , the greater their risk of developing a number of serious potentially life limiting health conditions, such as high blood pressure and heart disease, as well as 7 types of cancer. Regular drinking also leads to weight gain and obesity, which is associated with many more health problems.